The If Wishes Were Fishes board game combines very little luck and a good amount of strategy so that kids over the age of ten and adults can enjoy this game. Each player selects one color and grabs all the fish for that color, then takes six worms. The cards are shuffled and placed in the proper locations on the board. Finally, each of the "buyers" are placed in one of five markets on the board. There is no set market the buyers have to go. You use your worms to place them on the fish cards in order to take specific fishes. For example, to take the third card, you have to put a worm on the first two cards. If you don't have the worms, you can't get the card. Now, each boat (players get two) can hold one fish card. To empty the boat, you must either sell the fish to the market or throw it back. Double Fish: If the fish card is sold, it counts as two fish. The Boat Wish: You get an extra boat, giving you the ability to hold another fish card. Worm bonuses: Get $1 for each worm, then give your worms away. Sure you relinquish your worms, but you get money for them to buy more worms, etc. Move Buyer: Because you get more money depending on the buyer, you can shift buyers around the markets so you can then sell your fish for premium amounts. Spoilage: Move fish to and from the garbage pile. If all the "market limit" cards are on the markets, then the game ends. If there are 10 or more fish on the garbage pile, then the game ends. Whichever happens, whoever has the most money wins. Bonuses are given for any worms that you have left. 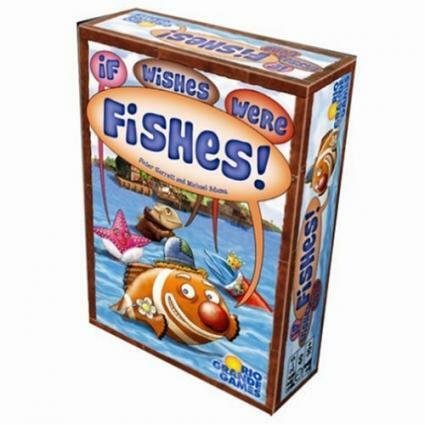 There have been many criticisms on the If Wishes Were Fishes board game that it's too hard to immediately pick up and play. There are quite a few things you can do on your turn, and it can get confusing, muck like the game of Life. There are a lot of scenarios that could happen, and you have to pay attention. There are a number of things you can do and then do when you use your wish. For younger players, this could get confusing, and for older players, it could get frustrating explaining the rules. Bring your patience if you plan on playing this with younger children. If your child is picking up the harder games, like Chess or even Backgammon, then he probably has the cognitive fortitude to understand the If Wishes Were Fishes board game. Also, his patience is just fine if his is sitting through that game of Chess without complaint. Even if he thinks he understands the rules, he will probably end up playing the game a few times before fully understanding the game and playing it smoothly without checking the instruction three or four times during a session. The board game is fun, so don't count it out just because of the complicated rules.